I chanced upon this picture and could not not share it. It’s the official Sales and Marketing report for the Anime ‘Futari wa Precure’. Check out the circled table which is labled ‘Main Target’ (audience). *For the record, I love Precure, with my favorite being Heartcatch. The original was good, but had some elements that really annoyed me, especially the ‘buy our merchandise’ vibe and stupid villains which thankfully has slowly been diminishing with each new series. Have to admit though, that theme is catchy as hell and I <3 Nagisa. That is all. This entry was posted on Wednesday, March 2nd, 2011 at 7:45 pm and is filed under Anime. You can follow any responses to this entry through the RSS 2.0 feed. You can leave a response, or trackback from your own site. sorry if this is a off-topic but you must see this it’s very important news! I read that post, and I doubt it’s actually gonna get truly cancelled. 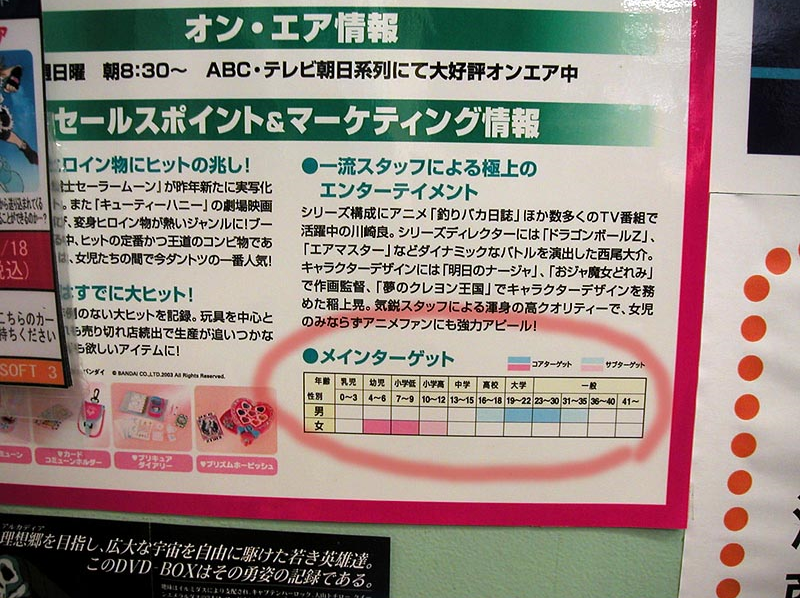 From the information on the article, it just seems like 2ch is blowing things out of proportion. And even more telling is that Artefact himself thinks it might not happen. For a sensationalist like him to actually downplay an event like this, gives me the feeling that the idea to pull it off the air might happen too late to matter, or in true political fashion it will be deliberated on to death and the idea will be withdrawn because they’ll be too scared of angering someone to go through with it. I have a bit of a theory on how Mahou Shoujo got this multi-demographic targeting. Mahou Shoujo series used to only be made for young girls, but as time went on, the producers figured out there was a sizeable demographic outside the intended one. Because of that, practically all Mahou Shoujo Anime made past the very early 2000’s was intended to appeal to multiple age brackets, even if it was still labled Shoujo. I guess you could say this trend started with Mahou Shoujo that was intended to solely target those periphery demographics, aka Seinen Mahou Shoujo like Mai-HiME/Otome, and the Nanoha franchise (of course the currently airing Puella Magi Madoka Magica falls into this as well). Thanks to those earlier forays, practically all Mahou Shoujo today is intended to bring in multiple demographics, even if it is technically within the shoujo demographic. You bring in a few Seinen elements to attract the older croud, and you keep it tame enough to parents don’t get startled at what their kid is watching. More money for the broadcaster. It’s a win/win situation. Site visitors Mayhem Review- the content articles on this article is truly a single of probably the most effective substance that i?ve actually are accessible throughout. I seriously like your article, I’ll are available once more to confirm for new posts. Hi, Neat post. There’s an issue with your website in web explorer, could check this? IE still is the market leader and a huge portion of other people will pass over your great writing due to this problem.